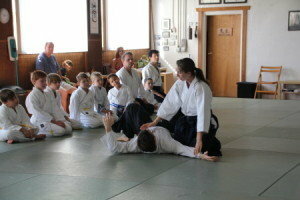 We offer youth aikido martial arts classes under an experienced instructor in a safe, fun, and disciplined environment. Classes include self defense and anti-bullying tactics, and each child is given lots of personal attention to keep them challenged according to their own level of physical and cognitive abilities and growth. For more information or to sign your child up classes, use the following form (all fields are required) or email jet@tampaaikido.com. Class size is limited, so get your child’s name in today! Our White Belt Class is a great way to start a young child out in the martial arts! Lessons are based on skill-building, instilling children with seven core characteristics of the samurai, including respect and courage. Students receive individualized attention from highly experienced instructors, and in addition to martial arts, learn lessons in safety and social skills, and even some easy Japanese – all while having a great time! In the All Levels Class, children increase their awareness, confidence, and posture. Rather than teaching them how to fight, they are taught how to stop a fight as quickly as possible. This is accomplished through the practice of redirection techniques, which in turn teaches them to align themselves to meet the situation at hand. These classes turns eager youth into self-motivated leaders. Teen/Pre-Teen Class builds on the strengths of maturing youth! Kids in this group are exploring newly developed physical stamina, mental acuity, and overall increased self-awareness. We introduce challenging new martial skills and self-defense techniques, and gauge progress through active goal-setting. We strongly believe that children achieve great things through consistency, persistence, and fulfilling aims. In class, even the youngest child’s effort counts in the progression to higher ranks, and older children accumulate credit which can eventually be applied to black belt testing. On top of attendance tracking, and along with frequent repetition in class, we also implement test prep sessions and frequent parent/child check-in sessions. Julie Tollen, a.k.a, Jet, taught aikido to youth ages for eight+ hours a week starting in 2009 before relocating to the Tampa area from Philadephia in 2013. She holds a third-degree black belt and began her martial arts training in 1997. From 2000-2004, she practiced aikido in Colorado under one of the nation’s highly regarded aikido instructors, Hiroshi Ikeda Sensei. She spent 2005-2009 living in Kumamoto, Japan, and studying under master aikido teacher Munetsugu Sakabe Sensei. 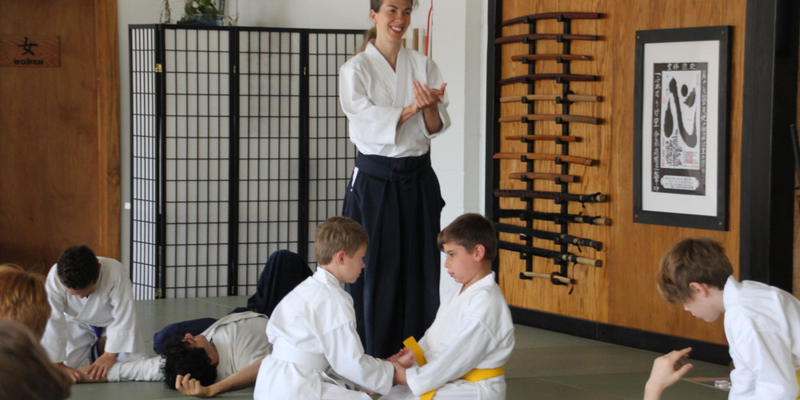 Teaching Aikido to children is a passionate undertaking for her; she recognizes aikido’s potential to guide the youth of today’s world to make engaged, aware and courageous choices. Ultimately, this helps them to become tomorrow’s powerful and peaceful leaders.